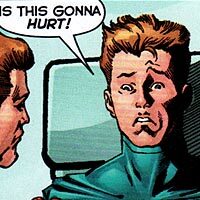 Daniel Jon Carter is a 21st-century ancestor of Booster Gold. 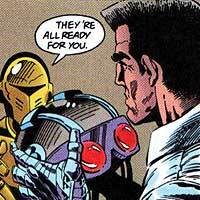 According to RIP HUNTER, Daniel and Rose Levin will generate the bloodline that will lead to Michael Jon Carter. Booster and Daniel have very similar histories that include aborted football careers and menial labor. Skeets II (see SKEETS) located Daniel Carter in Cincinnati, Ohio. Daniel Carter would play an unsuspecting but pivotal role in the events of 52 (see SUPERNOVA). Michelle Carter is the fraternal twin sister of Michael Jon "Booster" Carter, abandoned with her mother, Mrs. Carter, when Michael journeyed to the 20th century to adopt the role of super hero. In less than a year of time relative to Booster, he would return to the future and rejoin his sister while escaping persecution for the felony crime of unlawful time-travel (see BRODERICK). With little choice but to flee from authorities for aiding her brother, Michelle returned to 20th-century Metropolis with Michael. The twins were never especially close to one another, and each hoped that living as exiles in their past would allow time to foster a strengthened relationship. However, their relationship would suffer another great setback when Michelle accidentally stumbled into the schemes of the DIMENSION X ALIENS. The JUSTICE LEAGUE was able to prevent the aliens' imminent invasion of Earth, but Booster Gold was unable to save the life of his sister. 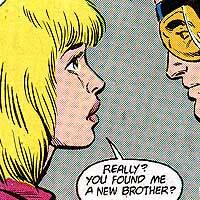 Michelle's apparent death remained a major motivation in the life of Booster Gold. Booster vowed that Michelle's death should not be remembered as a mistake in the life of a man playing at heroics, but as an unwelcome casualty of his fight against evil. Recently, Booster has had the good fortune of being reunited with Michelle through the intervention of RIP HUNTER, and Michelle has frequently joined her brother and his sidekick Skeets II (see SKEETS) as the costumed hero GOLDSTAR. 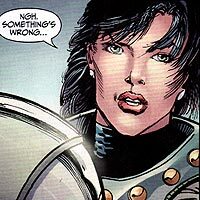 Michelle had a brief association with a 20th-century man named Drew, who was reported killed in the destruction of Coast City by CYBORG SUPERMAN. Checkmate was formed as a secret American intelligence agency under the direction of spy-turned-bureaucrat Sarge Steel. The agency uses the game of chess as its theme, and is divided into two halves: white for intelligence and black for operations. The organization was disbanded by the United States government after MARTIAN MANHUNTER worked to prove that MAXWELL LORD had corrupted the agency. The United Nations has since revived the organization into the espionage and enforcement arm of the Security Council. Booster Gold's first experience with Checkmate came when he joined the EXTREME JUSTICE team in answering Sarge Steel's holographic call for help against the terrorist bomb threat posed by the Crimelord. Booster Gold and the reassembled Justice League International (see JUSTICE LEAGUE) later ran afoul of Checkmate and its new Black King, Taleb Beni Khalid-Isr, in their search for Lord. Kansas native Trixie Collins moved to Metropolis to live with her Aunt Jeanie Collins. 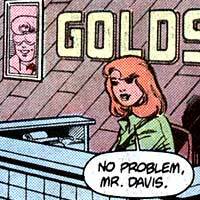 She was employed by Booster Gold as the secretary for both Goldstar, Inc. and BOOSTER GOLD INTERNATIONAL and was responsible for Booster's personal needs, including such mundane tasks as scheduling his limousine drivers (e.g. Sunny). Theresa "Trixie" Collins had a bit of a crush on her employer, Booster Gold, though something always seemed to come between the two. Trixie briefly acted the part of Booster's sidekick, GOLDSTAR, in order to save Booster's life. In her own words, Captain Sondra Crain is the first authorized chronal mission specialist of the United States government, and the acting agent of Project Slipshift. Booster Gold encountered Captain Crain while she was attempting to sabotage the space shuttle Excalibre in order to prevent the chain of events that would inevitably lead to the creation of the CYBORG SUPERMAN. Booster again met Crain during the cataclysm of Coast City, aiding her in saving four-year-old Grace Greene.